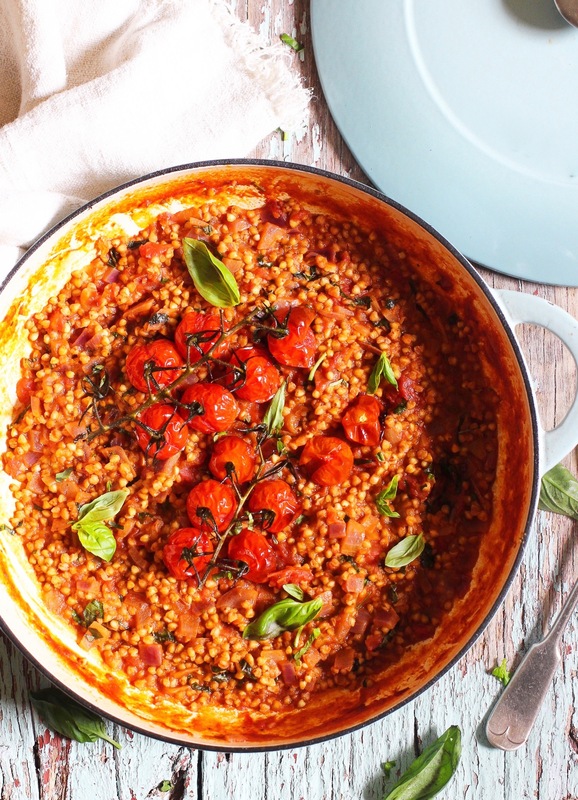 This oozes comfort but is lovely and bright with the summery flavours of roast tomatoes and fresh basil. I love the texture of buckwheat when it’s cooked like this, it’s somewhere between risotto and orzo but it’s higher in protein and fibre than both and full of antioxidants. Preheat the oven to 200’C. Place the cherry tomatoes on a roasting tray and drizzle them with a little olive oil. Season with sea salt and pepper and pop them in to roast for about 20 minutes. Add 2 tablespoons of olive oil to a large pan on a medium heat and add in the onion and the garlic. Cook until the onion is soft and translucent. Pour the chopped tomatoes into your stock and stir well. Add the buckwheat to the pan and toss well. Pour in about a quarter of the stock/tomato mixture and let everything simmer until the liquid is almost all absorbed. Then keep repeating in similar amounts until all of the stock is used up. When almost all of the liquid is absorbed, add in the almond milk and mix well. By this time, the tomatoes should be roasted. Add them to the pan with the fresh basil, stirring well. Cook your risotto until your desired wetness and serve hot with a sprinkling of fresh basil on top. Does this serve one or 2 people?